Anyone who spends any amount of time in the Senior High School department cannot help but marvel at the amazing work the principal, Dr. Lino C. Reynoso and the Senior High School teachers have come up with as the very design of their work indicates their commitment to making space for various learning styles. 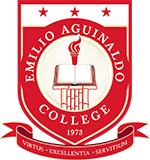 Dr. Reynoso and his SHS teachers have a deep interest in both excellence and equity: they want their students to do well, to know more and to be more skilled including in those areas that are necessary for the greater achievement of the future. 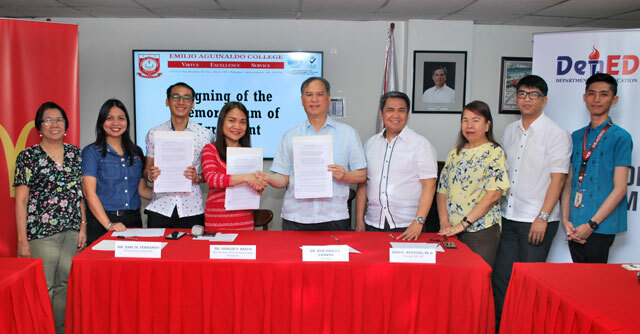 And it is with this interest and commitment that on November 6, 2018, a Memorandum of Agreement was made and entered into by Emilio Aguinaldo College represented by the President, Dr. Jose Paulo E. Campos and Golden Arches Development Corp. also known as McDonald’s Philippines, represented by its Senior Vice President, Chona Concepcion L. Torre, Vice President for Human Capital Group. Both parties agreed to allow the Grade 12 Senior High School students to undergo their work immersion at McDonald’s. This is truly a great opportunity that would give our SHS students vast experience in working as crew members at McDonald’s and gain a chance to be hired after their work immersion. This remarkable feat and partnership was forged through the tenacious effort of Mr. Ed Allen Uriarte, the SHS Work Immersion Coordinator. The Vice-President for Academic Affairs, Dr. Ellen Salac, Vice President of Administration/ Director of the Human Resource Department, Dr. Lorenzo C. Lorenzo, the Dean of Graduate School and SASTE and Principal of the High School, Dr. Lino C. Reynoso, were all on deck to witness this significant event.